Parked -- The historic railroad depot in La Veta, slated for demolition, has been sold to the town of La Veta for removal and rehabilitation. This photo, taken by Wendell Werner in the 1960's, shows the depot before Garden Club members painted the building and added “1876” to its east wall. Town of La Veta . . . 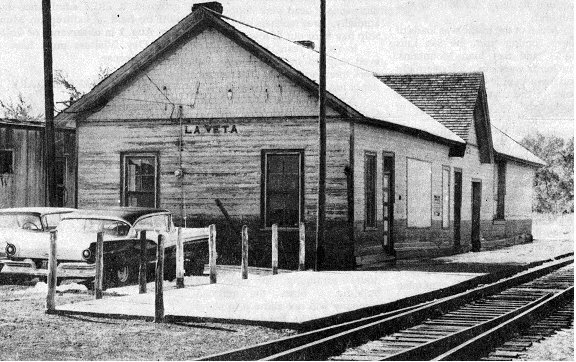 The Town of La Veta is this week signing a bill of sale to purchase the historic La Veta railroad depot for $1. The town has obtained a grant and contributions to enable it to move the structure within 90 days. It will be moved south into Town Park and rehabilitated at that site. While the actual date of construction is unknown, the depot was probably built in 1877 or 1878, making it over 120 years old. When the Denver and Rio Grande Railroad built its tracks into the town, it was known as Spanish Peak for the post office established in 1871. The post office was located in Francisco Plaza, or Fort, as were many other establishments. Two of these were the Field and Hill Forwarding Company, which supplied the railroad construction camps, and Andrew L. Francisco's "hotel." This latter was housed in several rooms of the plaza and probably consisted of flimsy bunkbeds and little else. The residents of town, who numbered less than 100, were prepared for the arrival of the railroad. Two hotels, Brink's La Veta and Sam Todd's Depot, were constructed quickly (not quickly enough, however, as the usual west winds tilted Brink's frame hotel noticeably to the east before it was completed). The Depot Hotel, built of brick, was located directly south of the tracks. The railroad brought a boom to La Veta, which was incorporated October 9, 1876, and the post office was renamed. Suddenly, the little settlement counted nine saloons on one street alone, Front Street, later Ryus Avenue. There were doctors, attorneys, blacksmiths and wagon shops, several grocery stores, three meat markets, a saddle, harness and shoe shop and other establishments. The D&RG ran its tracks right up Main Street into the plaza. Since there were no stores along that route, the tracks were laid right across what would later become E. L. Smith's store which most recently was Valley Hardware. In the plaza, a large room, formerly a grainery, was used as a depot. The tracks continued another block or so to the southwest. Engines were turned or backed north to a wye to continue their journeys. La Veta was the terminus of the D&RG until Garland City (about six miles east of Fort Garland) was built in 1877, meaning all freight and passengers transferred from the trains to wagons and stage coaches here. David D. Ryus, a merchant of 1876, later recalled the big coaches drawn by six horses pulling into the plaza, and the excitement which these arrivals caused. Most of the earliest trains passing through town carried railroad graders, materials and equipment for the construction of the grade over La Veta Pass. With the line completed to Alamosa, railroad cars began returning with produce arid livestock. After it was built into Creede and the branch to Durango was done, gold and silver ore were transported. Unfortunately, D&RG rates were high and many business people continued to drive livestock or wagons of goods and ore across the Baldy Scott Toll Road which also crossed La Veta Pass. Four passenger trains each day went through La Veta, two to the east, two to the west. Many of these were filled with tourists thrilled to cross what at that time was the highest railroad pass in the United States. In those days before dining cars, passengers still had to eat. Therefore certain cafes and restaurants were deemed the official dining establishments. At various times, both the Depot and La Veta Hotel served this purpose. In order to allow passengers access to the La Veta Hotel, a fence was built across what is now Town Park and what was then an alfalfa patch. With the fence, the passengers couldn't trample the crop. The "new" depot of the late 1870s handled all these passengers, all that freight and livestock. It also received and sent the mail and had the telegraph office. The depot was but a small part of the railroad yards. To the east were, eventually, huge stockyards, coal chutes and merchants' warehouses. The lumberyard established at the turn of the century had large sheds adjacent to the tracks for easy loading and unloading. Also east of the depot was the roundhouse built in 1885, which was actually rectangular but housed the round turntables for the engines. Here repairs were made. The depot was surrounded by tracks, both to the north arid south. West of the depot were two bunkhouses, several small structures used as coal or oil houses and other necessities, the Depot Hotel, the section boss's house and the water tank. The first water tank was wooden. It was replaced by a larger earthen reservoir (now Hobo Park) when water train service was established to old Cucharas east of Walsenburg. The water at Cucharas was too poor for use in the steam engines, so water was transported from the river at La Veta. The water train, which operated sporadically until the 1950s, also carried passengers so that La Vetans could board in the morning, ride to Walsenburg to transact business or go shopping, and return in the evening. Other people continued on the railroad to visit Pueblo and Denver, or connect with other trains to visit their hometowns in North Carolina or New York or other points east. The dirt tank was not efficient and was replaced by the large concrete water tank on Ryus Point. Both east and west were many side tracks. The wye was located north of the depot. The side tracks accommodated the many cars that overnighted in town during the early days. Later, in the mid-1890s, standard gauge tracks were built into La Veta from the east; tracks to the west remained the original narrow gauge. From this point on, La Veta was the transfer point for the standard gauge cars offloading to narrow gauge cars. It was said two narrow gauge cars were required to carry the load of one standard. Much of the traffic was loads of sheep coming from the San Luis Valley and San Juan Mountains. The herds were often left overnight and townspeople complained of the noise of the coyotes drawn to the stockyards by the bleating of penned animals. In 1899 D&RG finally began construction of the standard gauge over La Veta Pass. Thousands of railroad graders were sent in. Long trains of them passed through town, bound for tent camps along Middle Creek where the new grade would be situated. With the graders came smallpox and from April until June the town was in quarantine. By the time the all-clear was sounded, ten residents of La Veta and an unknown number of graders were dead. On the other hand, the graders brought prosperity. Again the saloons flourished, the hotels filled and restaurants struggled to keep up with hungry travelers. Another popular spot was the old calaboose, or jail, at that time located about where The Gallery is now. The new grade to Alamosa opened in 1901. No transferring was required now, but the depot remained busy as trains passing through grew in number. La Vetans often had snide comments to make about the railroad company allowing its property to remain shabby and untended. In response, the company let the town use the park if it would maintain it. The company decided to enlarge the depot in 1910. An 18 by 24 foot frame addition was built on the east end. Ornamentation in the form of simple gingerbread was added to the building. In 1917 another addition was constructed. This was a 30 foot extension also on the east. It held two waiting rooms, a storeroom, office and bathroom. Cement platforms replaced the old wooden ones. The structure was a homely one and the local editor cried for something to break up the bleakness. The company responded with the addition of a dovecote on the roof. D&RG also improved their yards about this time, pulling down old shacks, cleaning out debris and putting up a fence with an arch over the entrance. Through the 1930s and 1940s, most of the train traffic originating in town consisted of livestock. As the heart of the Hereford industry, thousands of head were shipped out annually. Area ranchers would also ship hay in or out of town. In recent years, trains haven't even stopped in town except for work trains and crews. The historic depot has fallen into disrepair. A project of the Spanish Peaks Garden Club about 1976 was to paint the old building. It was at that time the "1876" appeared on the east end of the building. The Denver and Rio Grande Western sold the line and property several years ago. The current owner is Union Pacific which no longer headquarters a crew here, so has no use for the historic building. In fact, it has become a liability. La Veta Town Board and several individuals put in long hours arranging to save the building. Since the railroad company will not allow it to stand beside the tracks, the depot is to be hauled across the road and become, after rejuvenation, a public building. Bravo!